^ Zürcher, Christoph. The Post-Soviet Wars: Rebellion, Ethnic Conflict, and Nationhood in the Caucasus [Online-Ausg.]. New York: New York University Press. 2007: 168. ISBN 9780814797099. ^ Population of NKR as of 01.01.2013 (PDF). NKR. 1 January 2013 [20 February 2014]. ^ ԼՂՀ 2015Թ. ՄԱՐԴԱՀԱՄԱՐԻ ՆԱԽՆԱԿԱՆ ՕՊԵՐԱՏԻՎ ՑՈՒՑԱՆԻՇՆԵՐԻ ՄԱՍԻՆ. STAF NKRE. 30 March 2016 [30 March 2016]. （原始内容存档于2016-04-16）. 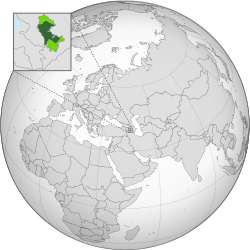 ^ Constitution of the Nagorno-Karabakh Republic. Chapter 1, article 1.2. ^ About Abkhazia – Abkhazia.info 互联网档案馆的存檔，存档日期2011-07-21.. English translation: Google translator. Link was not available/working 2014-12-21. ^ Official website of the President of the Nagorno Karabakh Republic. General Information about NKR. President.nkr.am. 1 January 2010 [6 May 2012]. ^ 纳卡地区冲突时间轴. 浙江日报. 2016-04-11 [2016-04-12]. ^ 纳卡冲突的历史经纬. 新华网-瞭望. 2016-04-11 [2016-04-12]. ^ Hughes, James. Ethnicity and Territory in the Former Soviet Union: Regions in Conflict. London: Cass. 2002: 211. ISBN 978-0-7146-8210-5. Indeed, Nagorno-Karabakh is de facto part of Armenia. ^ Cornell, Svante. Azerbaijan Since Independence. New York: M.E. Sharpe. 2011: 135. ISBN 978-0-7656-3004-9. 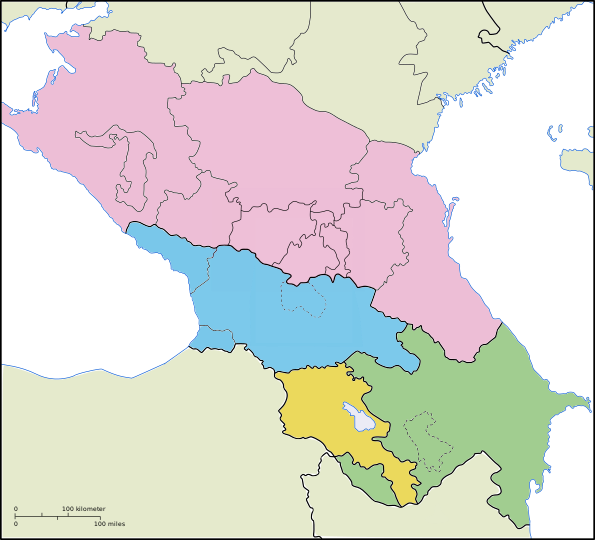 Following the war, the territories that fell under Armenian control, in particular Mountainous Karabakh itself, were slowly integrated into Armenia. Officially, Karabakh and Armenia remain separate political entities, but for most practical matters the two entities are unified.